NOW SOLD – THANK YOU FOR LOOKING For the past few days I’ve been sewing on clothing for this doll, that I’m affectionately calling “B”. I’ve been working on this doll for months, and for almost the entire time I’ve been thinking that she reminds me of a particular Izannah that I had seen somewhere… Yesterday I finally remembered exactly which one of Izannah’s dolls that “B” resembles. 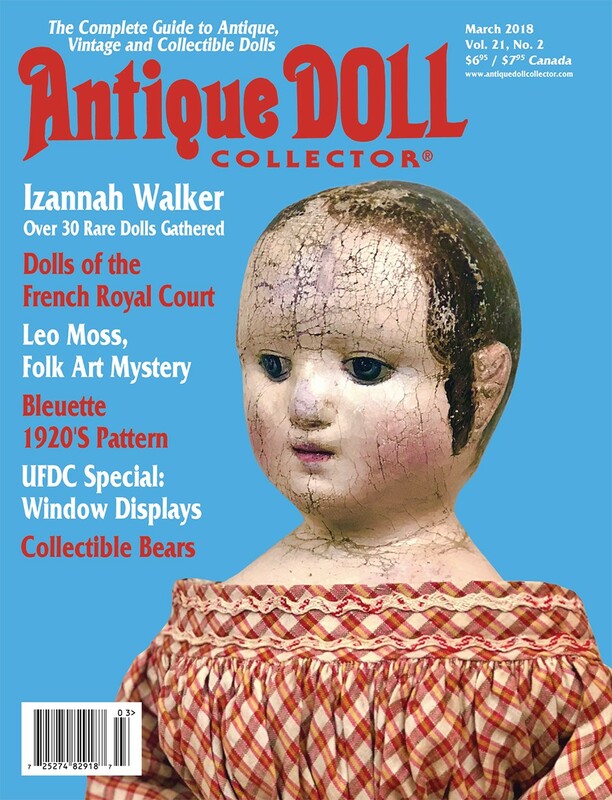 To me, she looks like the Izannah Walker doll at the South County Museum in Narragansett, Rhode Island. 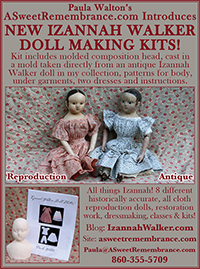 View the doll owned by the South County Museum here at the Izannah Walker Chronicles. SOLD Back of split pantalettes, showing contrasting white cotton waistband and piecing. SOLD Close-up of darning on linen pantalettes. SOLD Close-up of detail on pantalettes, chemise, petticoat and painted boots. 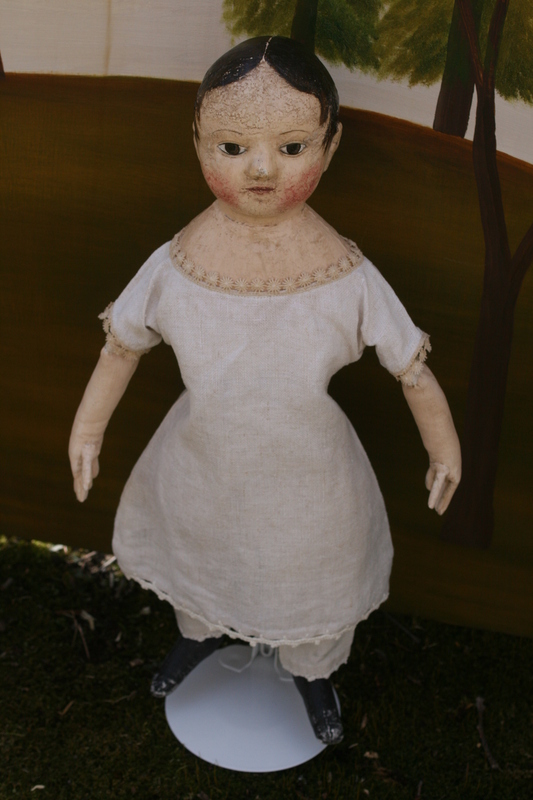 Because the doll has a very time worn appearance and aged paint surfaces, I wanted to use special fabrics that would reflect and enhance the feel of this doll and help tell her story. 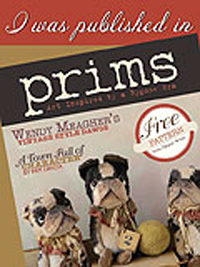 I used antique natural colored linen for her pantalettes, chemise and petticoat. I added vintage white cotton waistbands to the pantaletts and petticoat because I wanted the color contrast that is often seen in antique wool/cotton baby petticoats. Her pantalettes have been carefully pieced and darned. 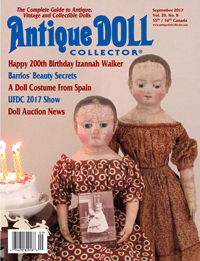 It took much longer to make them this way, but it helps to preserve the illusion of a much loved family doll that has been well taken care of and preserved to be passed down through succeeding generations. “B’s” dress is made from an amazing piece of madder brown fabric c.1850 that has never been washed. The color of the dye is so vibrant, with a crisp print and the original sizing intact. The dress has straight short sleeves and is trimmed with narrow velvet bands around the sleeves and skirt. It closes with an antique glass “china” button at the waist and a thin 1/8-th inch cotton tape drawstring at the neck. The dress skirt has been carefully darned and mended in two places and the inside of the waist band has a bit of contrasting fabric pieced in as a “make-do” detail. This is the ideal dress for a collector who loves early primitive cloth dolls and is a serious student of 19th century textiles. I’m strongly suggesting that this dress should not be washed to preserve the pristine documentary condition of the fabric dye and print. Inside of waistband showing “make-do” pieced lining. We still have some snow on the ground here in Connecticut from Friday’s storm, so today I’m going to make “B” a pair of detachable long sleeves to help keep her warm on chilly spring days. SOLD Sweet “B” needs her long sleeves to ward off the chill in the air today. She thinks they make her look very “Little Women”ish! SOLD “B’s” cuffs button on the inside of her wrists in the mid-19th century manner . SOLD Sweet “B” may be purchased on my website A Sweet Remembrance. Please feel free to email or call me if you are interested in purchasing “B” and have any questions about her or would like to see additional photographs. 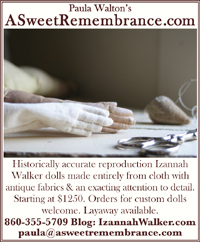 Paula@asweetremembrance.com, 860-355-5709. Lay away is available in terms to fit your budget. 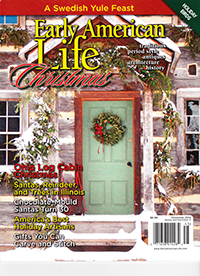 All payments, including lay away, may be made through Paypal, or by personal check or money order. You may pay using your credit card through Paypal, even if you do not have a Paypal account. 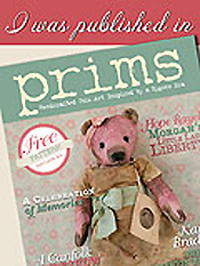 Free Priority Mail shipping, with full insurance and signature confirmation, to any location within the United States. 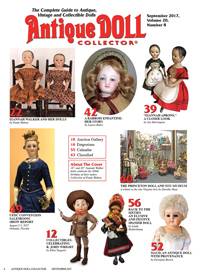 6.35% sales tax is charged on dolls shipped to a Connecticut address. Exact postage charged on dolls shipped to other countries. Next Post BOTH NOW SOLD – THANK YOU FOR LOOKING Two New Dolls Available ~ Dressed in their Easter Sunday Best!